Arlington, Va. (February 18, 2015)—No matter where you live in the country, you may have experienced problems with your telephone service. Whether you’re on the calling or the receiving end, these instances can be quite frustrating—particularly when the problems are persistent. Additionally, some calls placed to rural areas may connect but have “poor call quality” issues like echoes, transmission delays and choppy sound. If you experience these issues, there now are ways to report them with your phone company as well as with government agencies. These lost calls are often the byproduct of how long-distance phone carriers choose to route calls. Unfortunately, calls following the least-costly route can often fall into a loop of routers. Known as “rural call completion,” the Federal Communications Commission (FCC) is taking a multi-pronged approach to addressing the issue. 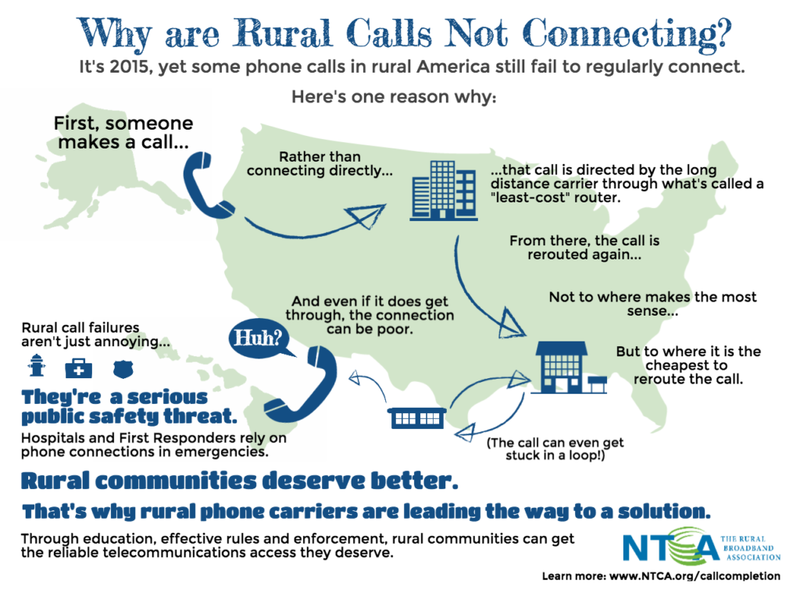 Additionally, NTCA–The Rural Broadband Association is advocating for rules and enforcement to end this practice, as well as uniting local carriers in an attempt to end rural call failures. In the meantime, consumers can help themselves. The FCC recommends reporting these problems to one’s long distance or wireless telephone service provider when they occur. Be sure to record the date and time of the call, the telephone numbers involved and the service provider of the calling customer. You can also file a complaint with the FCC. To learn more about these problems and how to report them, visit www.NTCA.org/callcompletion. As policies change, consumers can look forward to more reliable telephone service.